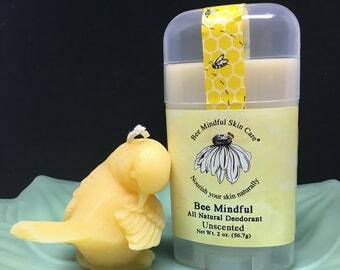 Announcement Bee Mindful Skin Care arose from a beekeeper's (me!) desire to make delicate, all natural skin care products from raw materials, including beeswax and honey. We offer a variety of handmade body soaps, salt scrubs, hand salves, shaving soaps, and more! WE WILL SEND YOU YOUR FREE PACKAGE OF OUR "Bee Forage Banquet" SEEDS WITH EVERY ORDER OVER $ 7.00 FOR YOU TO PLANT FOR OUR BEES! Bee Mindful Skin Care arose from a beekeeper's (me!) desire to make delicate, all natural skin care products from raw materials, including beeswax and honey. We offer a variety of handmade body soaps, salt scrubs, hand salves, shaving soaps, and more! 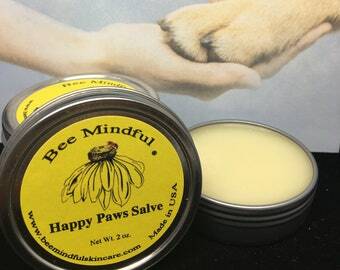 Our most popular beeswax lip balm. You will love the moisturizing oils and butters! 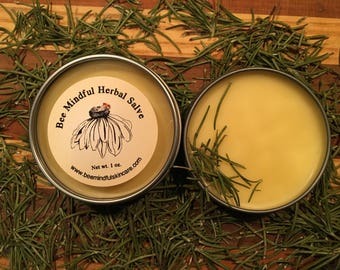 Our new Bee Mindful Herbal Salve has rich Jojoba Oil and Rosemary Essential oil! A few of our awesome honey oatmeal soaps! Bee Mindful Skin Care arose from a beekeeper's (me!) desire to make delicate, all natural skin care products from raw materials, including beeswax and honey, so that people with sensitive skin would not get rashes. This led from a hobby to a full-scale skin care business. 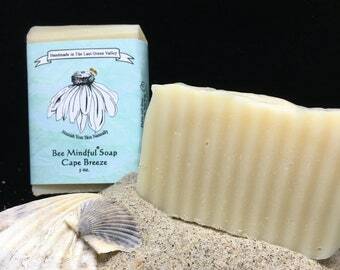 The products started out with honey and oatmeal soap. Then, goat milk soap was added and loved by many. As friends and family began to ask for more products, we experimented and created new recipes, which led to a great hand salve, body lotion and body cream, men's shaving soap and now three kinds of lip balm. The hobby started on Cape Cod, where we lived and worked for many years. Then on to upstate New York, where we ran a small specialty berry farm. Bee Mindful Skin Care was created from many hours of planning, sample trials, and comments from customers. We, as well as our bees, have now settled back in Massachusetts, and find it quite pleasant. It is our hope and mission to spread bee-loving flower seeds all around the United States, like Barbara Cooney wrote about in her famous children's book entitled," Miss Rumphius". We feel so strongly that the bees need our help, and that collectively we can, each one of us, make a real difference in their survival. People of all ages need to come together for this to be successful. We offer a wonderful wildflower mixture that has been repackaged for you that we call Bee Forage Banquet. This wildflower mixture was designed to create a foraging site for bees and other native pollinators with the nectar and pollen necessary to aid in the survival of these species. We will send you a free package of these wildflower seeds with every order that totals over $7.00. We, here at Bee Mindful Skin Care, have produced a variety of wholesome skin care products that nourish your skin naturally. We are continually creating new recipes and testing new products. Friends, family, and customers have remarked that they are in love with our products. It is easy to understand why, because they are made from only high quality natural ingredients. Bee Mindful Skin Care L.L.C.